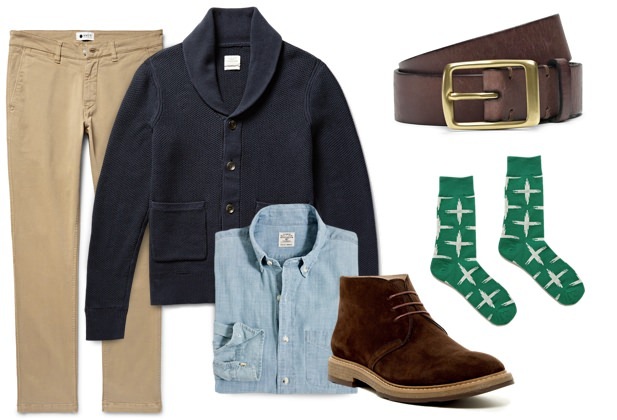 3 Fool-Proof Thanksgiving Outfits | Valet. 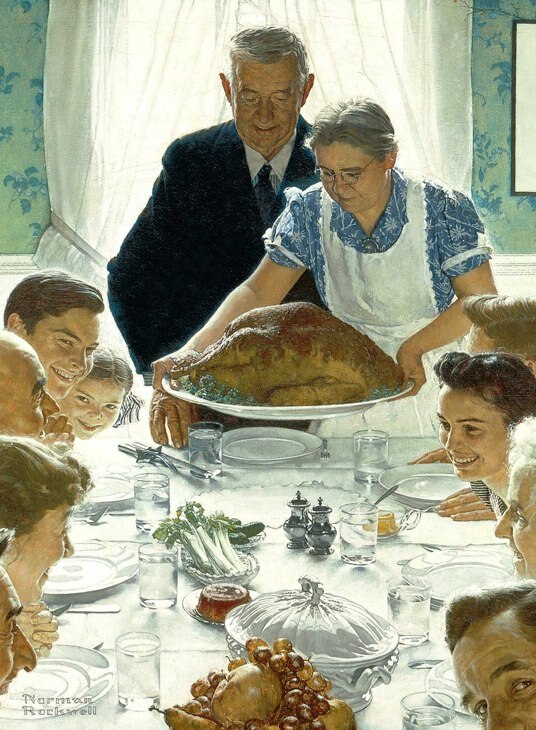 An American tradition: Norman Rockwell's famed "Freedom from Want," published in The Saturday Evening Post in 1943. As Thanksgiving fast approaches, you've likely got one thing on your mind: eating. Two things if you count the drinking. After all, it's a long weekend centered around an indulgent free-for-all of comfort food, desserts, booze and left-overs. It's a break from work, where we can take the time to relax and count our blessings. But it's also the kickoff to a season of social gatherings. Those special occasions where you see the friends and family you haven't seen in months and also meet new people. So don't just indulge your appetite—make sure to put some effort into what you wear to dinner. 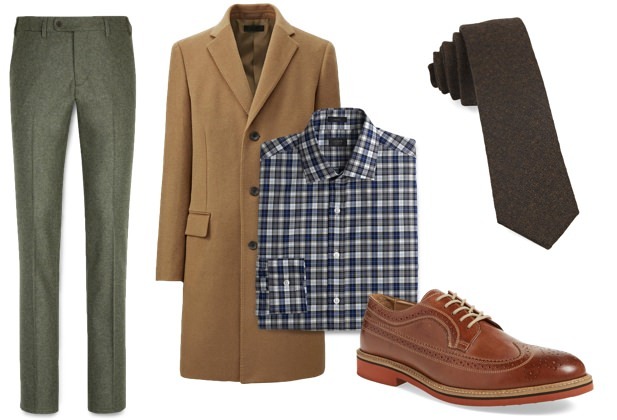 Herewith, three options for leaning into fall fabrics while focusing on comfort as well. If you're not heading home, but instead getting together with a group of your friends to celebrate Turkey Day, you can be pretty chill about your outfit. 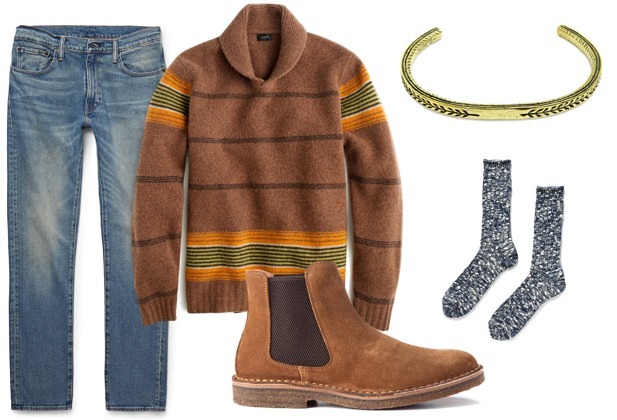 Go for comfort with your favorite jeans, a pair of suede Chelsea boots and maybe a cozy sweater. Since spilling is a real concern after all the booze and tryptophan, opt for patterns or pumpkin-pie shades to camouflage any party fouls. It's your family. Be comfortable. But show your mom and dad some respect by showing up with your shirt tucked in. And maybe top it with a light blazer or knit cardigan. Since you can't show up in sweats, a pair of chinos cut from an ultra-comfy stretch twill will leave you plenty of room for seconds. First impressions are crucial, and your main goal today (besides feasting gluttonously) is to get the glowing approval from the parents. Your best bet is to look sharp and put-together. Maybe even knot up a tie and polish your shoes for good measure. The Wall Street Journal offers up some expert tips on how to have a calm Thanksgiving dinner without a family blowup.